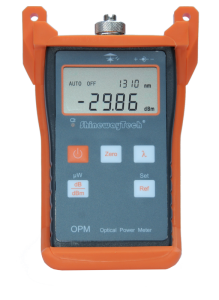 The Shineway OPM 15 L series of optical power meters are low cost, rugged and reliable.Similar to the standard OPM 15 series the Shineway L series offers the benefit of taking an LC adaptor cap. Simple to use with dB rel facility for each of the wavelengths 850,1300,1310,1490,1550 and 1625nm. Simply select the wavelength to test, zero out the light source to take relative measurements or select dBm for absolute measurements. Coupled with the Shineway SLS series light sources provides the perfect test set up for measuring loss on the fibre.